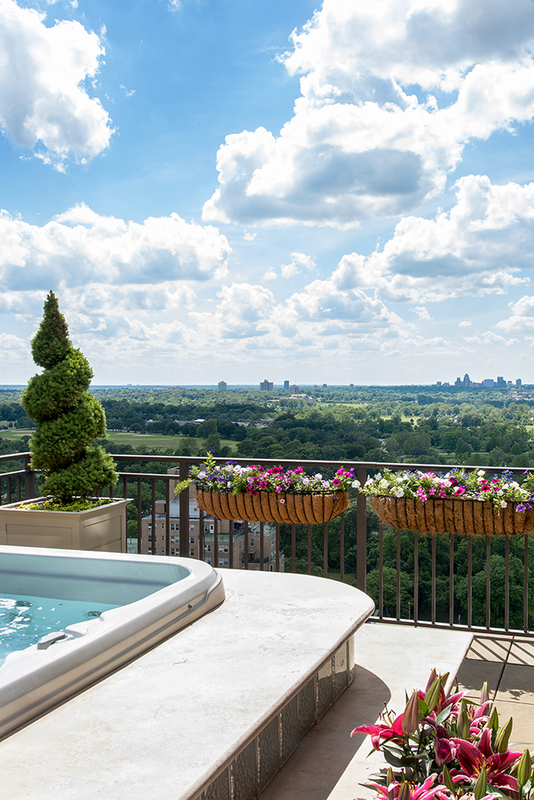 Brilliantly designed, this sky-top condominium in the CWE capitalizes on its 360-degree views of the city. 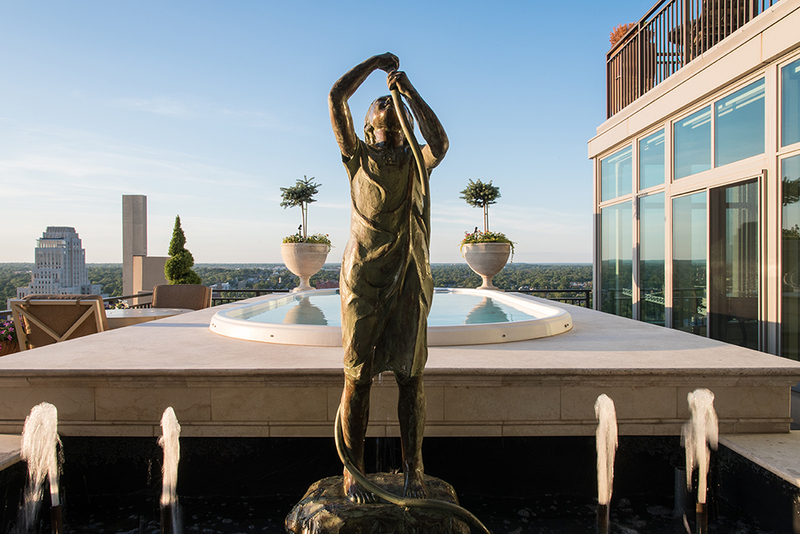 A delightful sculpture by Corinne Hartley lends charm to the bilevel fountain and swin spa. Above the kitchen's magnificent granite-topped island, a drop soffit repeats teh curve of the family room window wall. 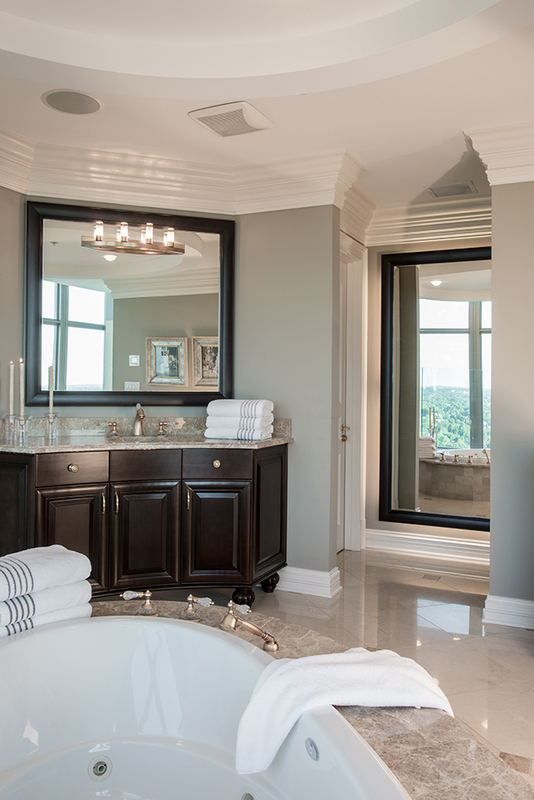 The master bath is dominated by a jetted island tub, surrounded by gleaming marble and rich maple cabinetry. The cream-toned cabinetry is accented with classic ribbon-and reed brass hardware from Amerock. 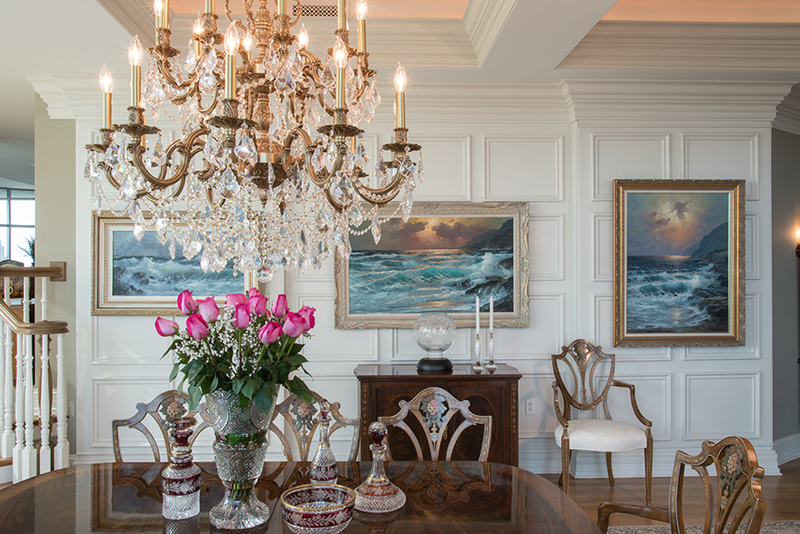 Powerful seascapes by Alexander Dzigurski and his son, Alexander II, add color to the exquisitely detailed wall of the dining area. Superbly crafted, a dramatic box-beam ceiling spans the open living/dining area. Graceful chairs flank the living room fireplace. 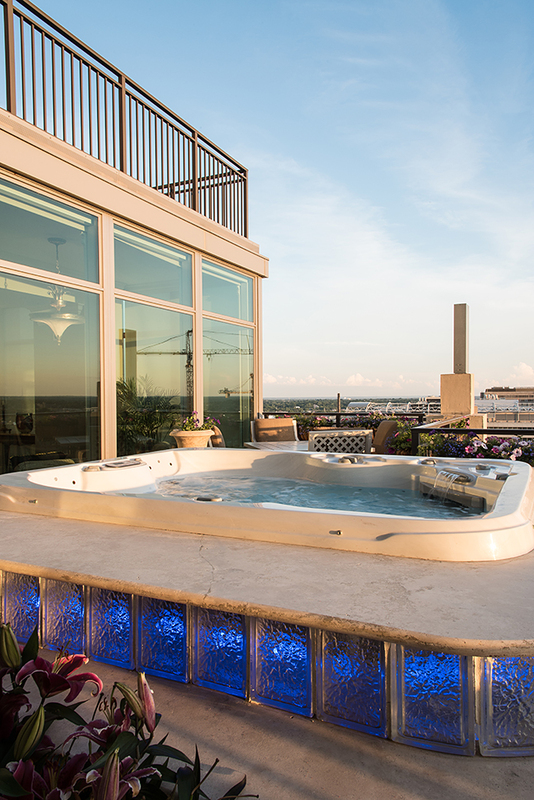 Spectacular day or night, views from the terrace's disco-lit hot tub extend for miles. Keystone arches and unique lighting fixtures from Florida line the hall to the condominium's east wing. 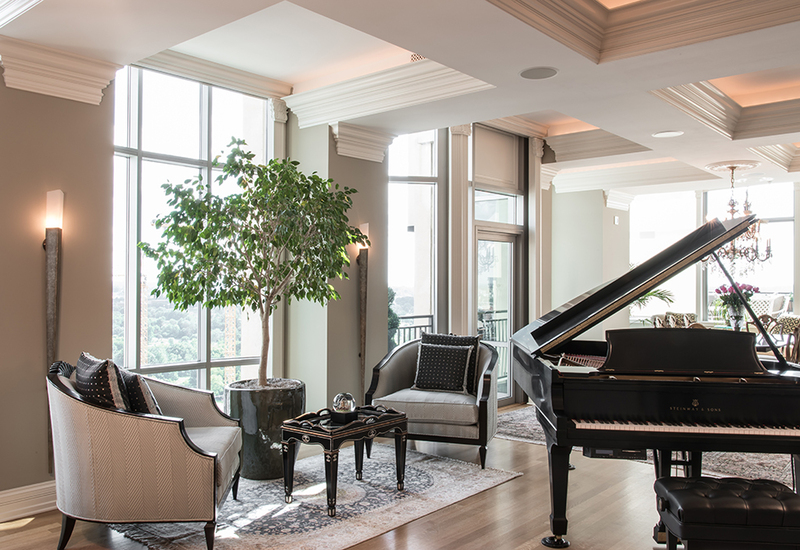 Surveying the landscape from his spectacular terrace, the owner of this high-rise condominium in Park East Tower quips, “It’s like having the ultimate model train set. Looking down, you can see everything in miniature.” Behind him, a fountain burbles softly and sunlight sparkles on the surface of his swimming pool… yes, a private pool, hundreds of feet in the air! A radiologist at Anderson Hospital in Maryville, IL, the owner considers the Central West End a “practical location” for his daily commute and had owned several other units in the eclectic downtown neighborhood. Park East caught his attention while the building was still in the planning stages, and he purchased an entire floor from the developer, Opus Northwest, during preconstruction. Working with Nathan Bavolek of Opus and longtime St. Louis builder Vern Hackett, he custom designed a unique L-shaped floorplan that allows for panoramic views of the city in every direction. The finished layout provides nearly 4,000 square feet of interior space and another 1,600 square feet of outdoor living space, including three balconies and the massive terrace. The owner’s choice of Hackett was never in question. The two met in the early 1990s. Hackett worked on and built two of the owner’s former homes and, over the years, their respective families have become close friends. 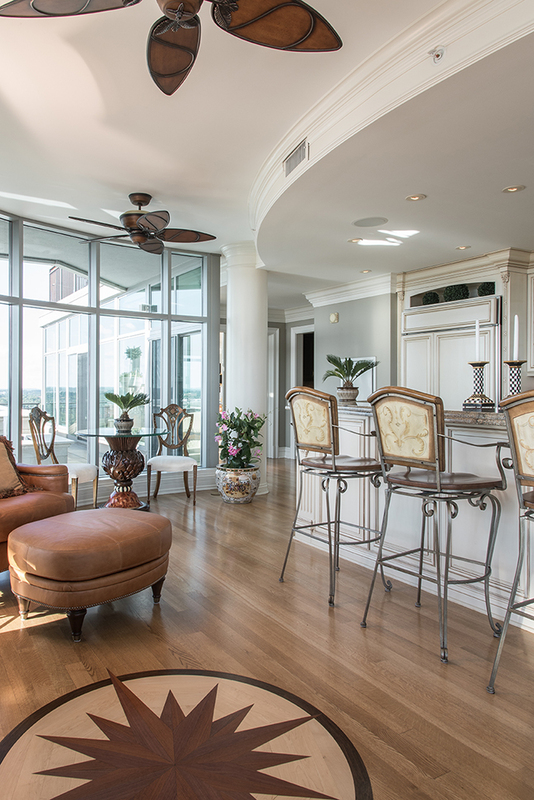 On hand for the tour, Hackett described his client as having “really good visions,” adding that much of the interior décor for the new condominium was designed to recreate the elegant traditional styling of the owner’s previous home in Ladue. 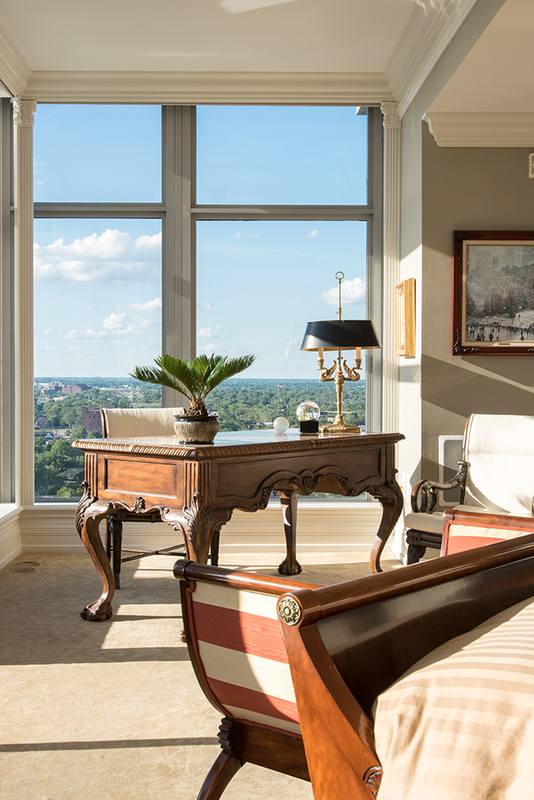 As intended, the condominium’s ambience is dominated by its expansive window walls and breathtaking views. 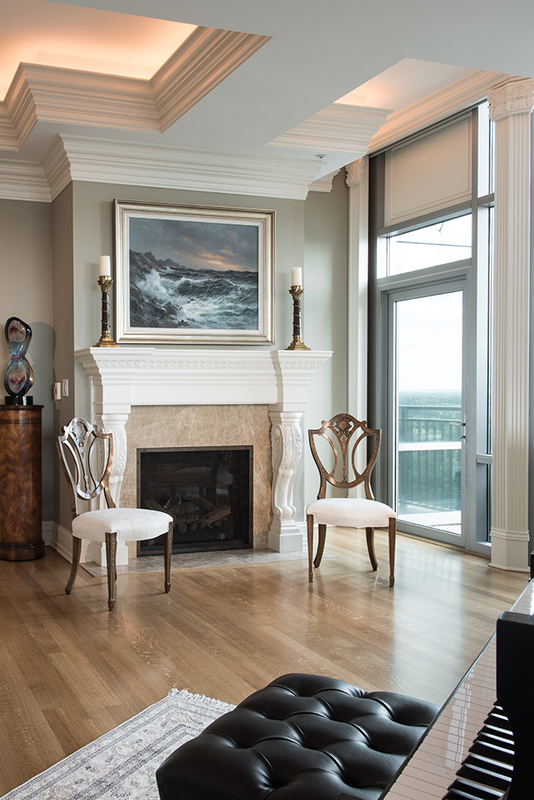 High ceilings enhance the sense of volume, and taupe-toned walls and quarter-sawn white-oak flooring establish a neutral background for the dramatic architectural elements and the owner’s classic furnishings and original artwork. A box-beam ceiling with recessed lighting spans the vast living/dining area, and Oriental silk rugs define the individual spaces. 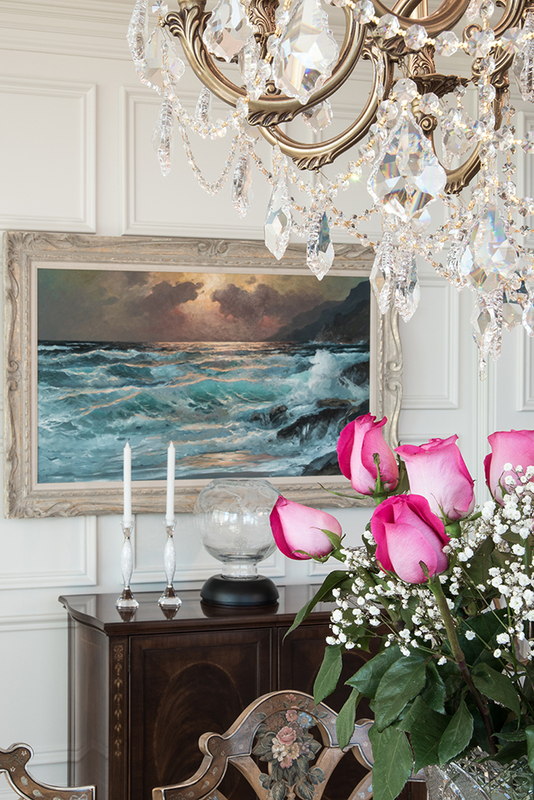 Designed and crafted by Hackett, the living room’s imposing fireplace is embellished with a powerful seascape by Serbian-American artist Alexander Dzigurski. 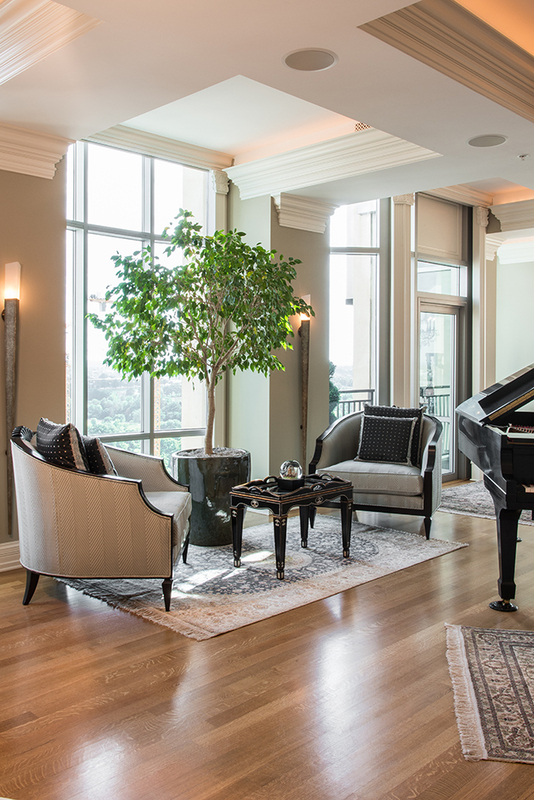 The Steinway grand piano is flanked by an intimate seating arrangement – Christopher Guy chairs upholstered in a bold silk herringbone and a lacquer tray table – and a well-established ficus tree in a planter from Bowood Farms brings a touch of nature inside. The dining area showcases a large crystal pendant chandelier, suspended above an exquisite crotch-mahogany table from the Heritage Heirloom Collection. Inlaid with a border of ribbon-striped mahogany, the table is surrounded by hand-painted fruitwood dining chairs, and additional seascapes – two by the senior Dzigurski, another by his son, Alexander II – are displayed on the interior wall. Unique ceiling fixtures light an arched hallway leading to the sun-filled suite reserved for the owner’s mother, a spritely nonagenarian who thoroughly enjoys her magnificent view of the Arch to the east. The hall also illustrates Hackett’s ingenuity, with tall, picture-framed mirror panels concealing access to the home’s mechanical equipment. Returning to the dining area, a short flight of steps leads up to the family-room level, where a curved floor-to-ceiling window wall integrates the space with the expansive open-air terrace. A compass symbol, embedded in the floor, is a reminder of the multidirectional views, and a saddle-colored leather sofa with curved back fits perfectly into the rounded nook. Set against one window is another clever Hackett innovation – a large, dual-screen TV lift cabinet, handsomely crafted and viewable from both the family room and the outdoor hot tub. Open to the family room, the spacious kitchen also exhibits the builder’s fine craftsmanship. 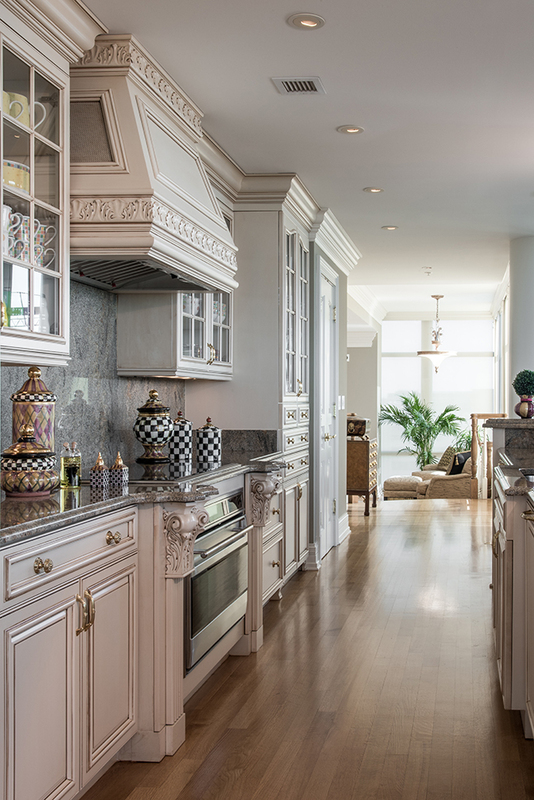 Corbels carved with Corinthian acanthus leaves support the 15-foot island, and Junipero del Classico countertops from Brazil complement the cream-colored, umber-glazed cabinetry, Amerock brass hardware and custom range hood. Two dishwashers and an icemaker were of special importance to the owner, since he entertains frequently, and other state-of-the-art appliances include two Wolf ovens (one in the butler’s pantry) and a Sharp cabinet-drawer microwave. In the theater room, the marble-topped, curved bar is accessible from both sides, another of the owner’s specifications. Equipped with a wine cooler, refrigerator and icemaker, the bar provides easy beverage service for guests viewing the 65-inch screen from two gloriously comfortable massage chairs. Adding a splash of color to this fabulous entertainment space are a vivid circular canvas and two additional paintings by Brazilian artist Romero Britto. Occupying a full wing of the condominium, the owner’s retreat features a Russian sleigh bed and matching chest, bench and dresser, all in pecan from Frank Patton Interiors. Seven ink-and-wash drawings by a Russian artist carry the theme from the master bedroom to the sumptuous bath, with its circular soffit, oval island tub, sunken shower, oversized Crema Marfil floor tiles, Grohe fixtures and dual vanities with LEDs under-lighting the Emparador Light countertops. Although privacy is hardly an issue at this height, the bedroom windows, like all of the windows throughout the home, were fitted with automated privacy shade systems by The Sound Room, who also installed the whole-house sound system. 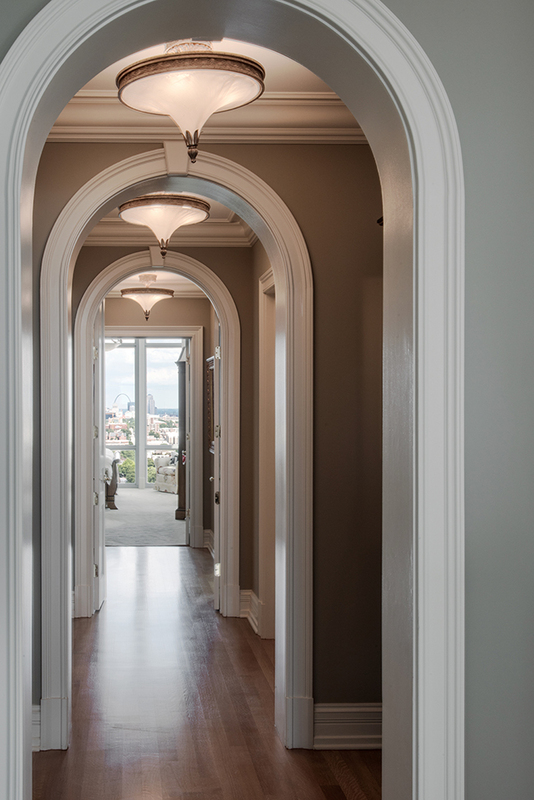 Always attentive to detail, Hackett concealed the shade tracks in the owner’s suite with classic columnar wood trim. The home’s pièce de résistance, however, is the massive, multilevel terrace overlooking Forest Park to the west. At the north end is a bilevel Dimension One swim spa and fountain, designed by Bavolek and encased in marble by Hackett. Splashing water into a subtly lit pool, the fountain is a charming bronze sculpture by Corinne Hartley. McKinnon and Harris outdoor furniture, upholstered in a Tommy Bahama fabric, an electric grill and two granite serving counters fill the center of the terrace, and at the far end is an Aspen Spas hot tub. Disco lighting creates an ever-changing display of color through the hot tub’s glass-block surround, and the deck is arrayed with automatically watered planters, lush with greenery and bright seasonal flowers. Brilliantly designed and masterfully crafted, this extraordinary residence is truly an architectural wonder – an urban haven in the sky, high above the hustle and bustle of the city streets.